This week we have a guest blogger, Sam Azzaro. Sam served as an intern with us this past summer. His project involved our collection of bannerstones that includes approximately 500 whole, partially complete and broken specimens. 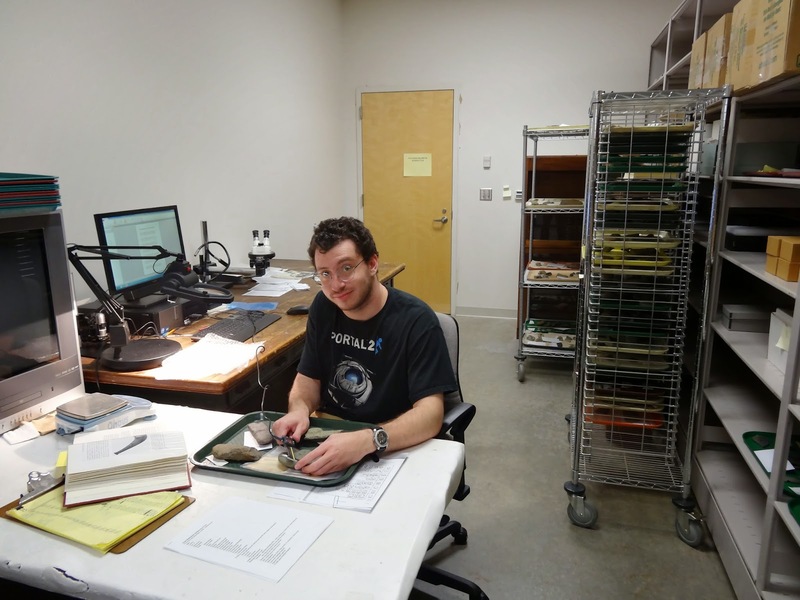 He collected basic data that will allow us to better characterize bannerstones in Pennsylvania. Building on this, archaeologists will have a better idea of how they were made and generally how they may have been used. 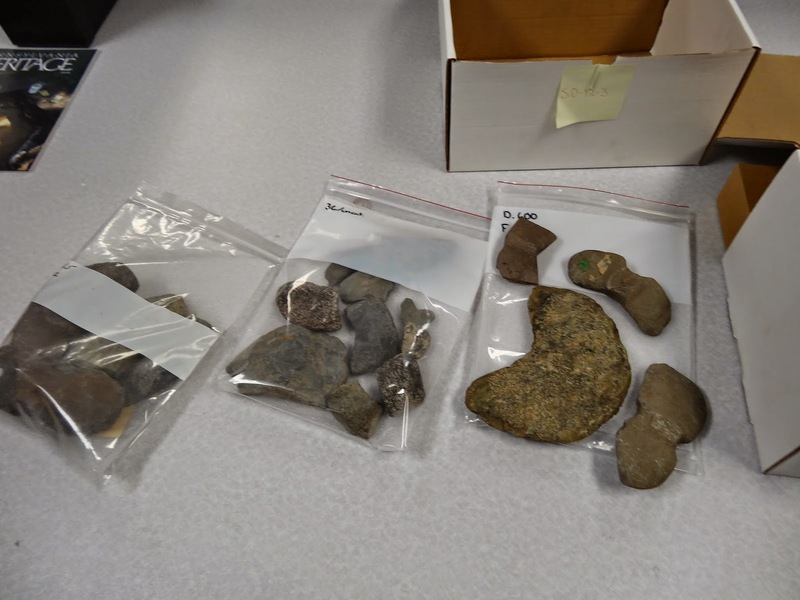 The State Museum has other similar collections that would benefit from this type of analysis (gorgets, axes and adzes, pitted stones… ) and we are always looking for interns to gain the experience. Below is Sam’s report. Anyone who knows me will acknowledge that I have had a deep interest in the ancient and prehistoric past, as far back as I can remember. As you can imagine, this led to having a somewhat unique childhood, preferring to spend my free time learning about a variety of things I found fascinating, such as the Maya, the Roman Empire and prehistoric creatures, at an age when most children would have considered these activities to be a fate worse than death! Over time, my unique interests brought me to Dickinson College, where I will be graduating in May 2015 with a major in Archaeology, a concentration in Anthropological and Environmental Archaeology, as well as minors in Anthropology and Earth Sciences/Geoscience. It’s amazing to think that the educational journey I began many years ago toward becoming an archaeologist will finally be complete. Now, there is also the matter of going on to graduate school and actually finding a job in the field of archaeology, but, as a college senior looking back on the many years it took to get this far, I'm just going to choose to enjoy the moment! But, all kidding aside, having the opportunity to intern this past summer in the Archaeology Section of The State Museum of Pennsylvania, was an incredible experience and an invaluable step in my journey toward entering into the field of archaeology. My work as an intern this past summer had been centered on a kind of Native American stone artifact known as a bannerstone. 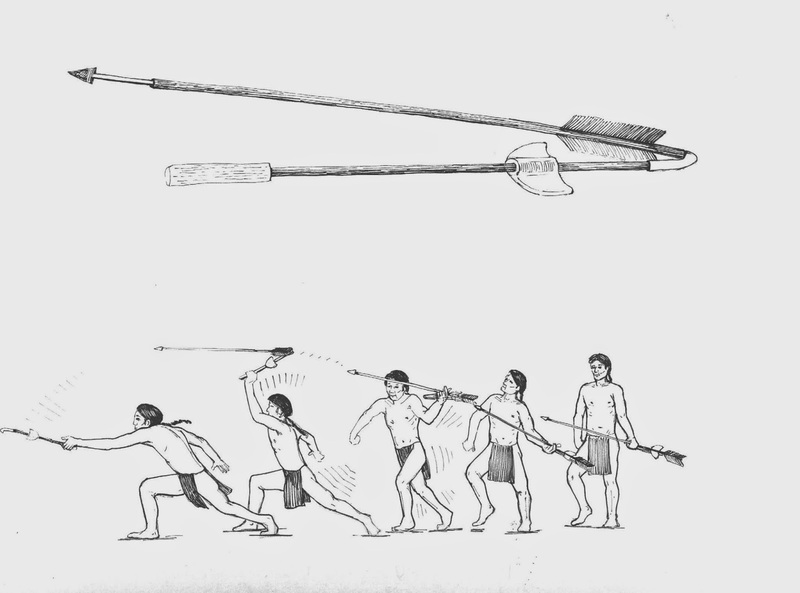 The archaeological community currently classifies bannerstones as a special kind of weight that Native Americans would have placed on their spear throwers. But, to be totally honest, not everyone agrees on this explanation. It is primarily based on one site in Kentucky where bannerstones were found in alignment with the handle and the hook of what appeared to be spear throwers. This seems like conclusive evidence but when people have experimented with actually using bannerstone on spear throwers, they could not detect a significant improvement in performance compared to spear throwers without weights so the jury is still out on their function. Yet, this function has continued to be associated with bannerstones, seemingly due to the simple fact that no alternative function has been proposed and effectively proven accurate by a formally educated and credentialed member of the archaeological community. Let us establish something right off the bat. No, I did not manage to solve this centuries old mystery during my internship this summer. And, furthermore, most of the work I performed had nothing to do with solving this mystery. Essentially, most of my internship responsibilities consisted of cleaning, re-labeling and cataloguing the museum’s collection of bannerstones. To some, this might seem like grunt work. However, the reality is that each of these tasks is crucial in allowing museums to "function properly" for both visitors and researchers. Whether an artifact has been dug out of the ground a day ago or has sat on a museum shelf for centuries, it requires thorough cleaning before it can be displayed to the public or studied by archaeologists. Additionally, in order for museums to function properly as repositories of artifacts, these artifacts must be labeled and stored in a succinct and uniform manner, so that any single piece in a collection may be located, removed for display or research and returned to its appropriate storage location, with ease. In truth, learning how important these duties are, along with how truly rigorous they are to perform, was one of the most significant things I learned this past summer. Simply put, this internship provided me with a realistic, hands-on orientation pertaining to what a significant aspect of archaeological work at a museum consists of, which will play into the career path I choose to pursue in the near future. Now, the other important portion of work that I focused on during my museum internship consisted of collecting a range of measurable and observable information from the most intact, as well as the majority of fragmented bannerstones, in the collection. 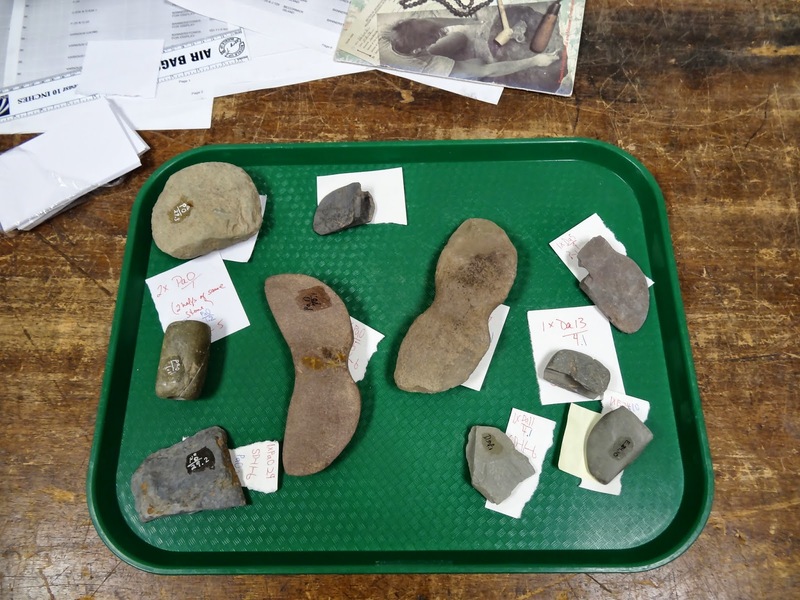 In other words, I examined almost every bannerstone specimen, after each had been cleaned and re-labeled, collected previously unrecorded information about them (what shape they were, what they weighed, etc. ), and then placed them into storage. While the data I recorded won't resolve the ongoing mystery as to what bannerstones’ actual function was, it does provide an "information base" upon which future researchers can build and, perhaps, someday, possibly even utilize to solve the aforementioned mystery. Finally, I would be remiss if I were to not mention that much of this examination was performed under the direction of Senior Curator of Archaeology, Kurt Carr. That said, I would like to thank Dr. Carr, along with the other members of the State Museum's archaeology department, for their help and guidance during my internship. It was an incredible experience that I will never forget. Here we are again, a new year and the grand event of the Pennsylvania Farm Show. The 99th annual PA Farm Show began last Saturday January 10, 2015 and runs through tomorrow Saturday January 17 at 5 p.m. As in past years, The State Museum of Pennsylvania’s exhibit is set up in the Family Living section, located in the main exhibition hall of the Farm Show Agricultural Complex. In cooperation with the Society for Pennsylvania Archaeology and the Landis Valley Village and Farm Museum we have put together quite an exhibit. This year’s exhibit demonstrates how environmental changes have contributed to the social and technological adaptations of humans in Pennsylvania beginning around 19,000 years ago. The exhibit features artifacts ranging in time from the Paleoindian period to the Late Woodland and includes projectile points, scrapers, knives, bola stones, net sinkers, adzes, axes, grinding stones, pottery, bone fish hooks, pestles and more. Our exhibit also includes informative panels discussing how the environment changed throughout these prehistoric periods and the responses by humans, which we can see through the artifacts and floral and faunal remains. Don’t forget that our 20 foot long replica dugout canoe is also featured in the exhibit. Everyone is welcome to stop by and test it out by climbing in and imagining how it would have been to live hundreds of years ago with this as one of your main modes of transportation. While taking a “ride” in the canoe you can read our poster and look at the photos about how dugout canoes were made and how the State Museum’s archaeologists and volunteers made the exact canoe you are sitting in through traditional methods with traditional stone tools. 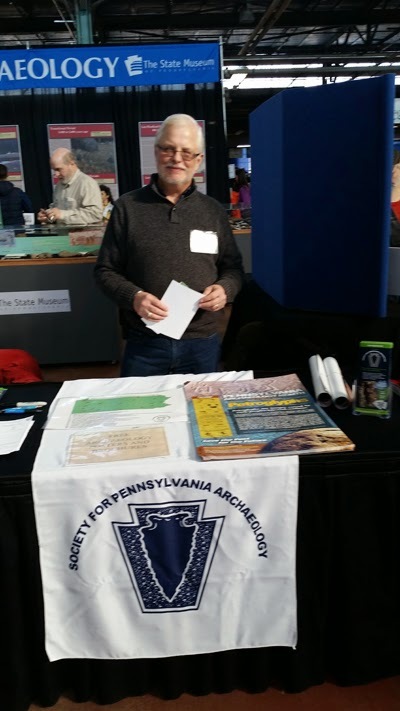 Members of the Society for Pennsylvania Archaeology (SPA), as in years past, will be on hand offering information about the organization and answering questions. If you are interested in joining the SPA; new memberships include the biannual journal Pennsylvania Archaeologist, announcements of the annual SPA meeting, newsletters and as a special Farm Show bonus of three previous issues of the SPA journal will be included. So stop on by and see what SPA is all about! In addition to the State Museum’s artifacts and panels, this year the Landis Valley Village and Farm Museum has put together a display with additional brochures and booklets about events happening at the museum. There is also information about their Heirloom Seed Project, which preserves Pennsylvania’s past through heirloom vegetables and plants that were significant to Pennsylvania Germans from 1750 to 1940. Thus far, the 99th annual PA Farm Show has given us the opportunity to reach thousands of individuals with a current count at 32,736 and a projected count of 46,128 visitors total for the week. With a visitor count like this we have been able to disperse thousands of brochures, magazines, posters, tattoos, and free planetarium show tickets. 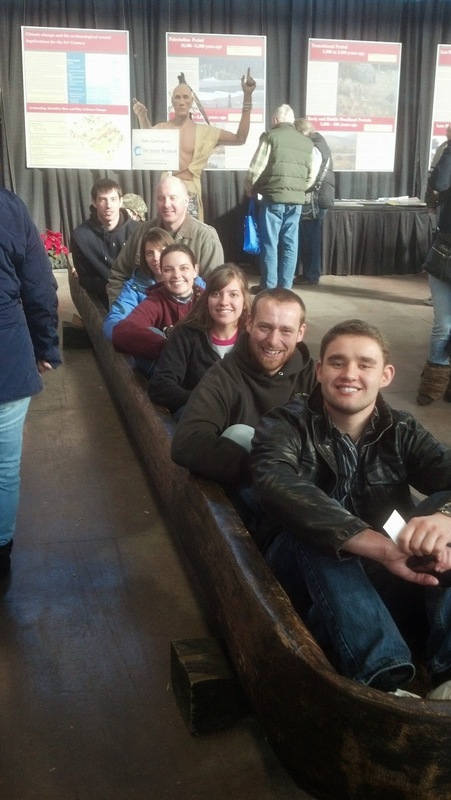 Most of all the PA Farm Show has always given us the opportunity to share our knowledge of Pennsylvania’s past with all those who take a moment to stop by, sit in the canoe and chat with our volunteers and staff. 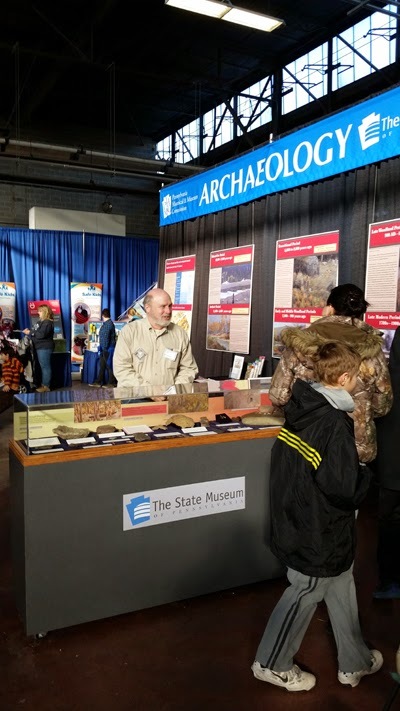 We hope to see those of you who have not already visited tomorrow to let us share a little of Pennsylvania’s history and archaeology with you. Ringing in the New Year with Sleigh Bells! To help us ring in the New Year and in the nostalgic spirit of a snowy holiday season this week in archaeology will focus on a common artifact found in Pennsylvania homesteads and stables from the colonial period through the early 20th century—“S” is for sleigh bell. Ornamental crotal or rumbler bells with engraved petal motifs were manufactured in British foundries as early as the 1500s. During the colonial period, mold-cast crotals with similar motifs were imported in large quantities to the Americas. They adorned animal tack, carriages and sleighs of European settlers; and were traded to Native Americans who re-incorporated bells into their own cultural practices, using crotals for personal ornamentation. By the late 19th and early 20th centuries, petal bell crotals became commonly known as sleigh or jingle bells, names popularized in Victorian-era Christmas carols still sung today. Five of six sleigh bell crotals were recovered from PHMC excavations at Conestoga Town (36La52), a Susquehannock village site of the period from 1690-1740 (Kent, 2001; 207-208; 386). Based on their archaeological contexts, these bells are likely of British manufacture sometime in the late-17th to early-18th century and exhibit a slanted u-shaped shank typical of the period. While local metal smiths are likely to have produced crotals prior to the mid-1750s, the first commercially established foundries in the American colonies casting sleigh bells on a large scale were not operating until the latter half of the 18th century. Two sleigh bells from Conestoga Town exhibit a W.K. or M.K. makers’ mark which may link them to the Knight foundry (1518-1709) of Reading, England. The bell pictured below is engraved with the initials G.W. or W.G. ; a common mark associated with Aldbourne, Wiltshire foundries of the 17th and 18th centuries (Hume, 1969). The W.G. maker’s mark cannot be ascribed to a specific bell maker until the late-18th century, William Gwynn. However, it is present on many examples of earlier dated crotals produced in the Wiltshire region prior to the establishment of the Gwynn foundry (1770-1813). (Link to Blunt for more information about the history of crotals and British foundries). Seventeenth-eighteenth century sleigh bell, petal-decorated on upper and lower hemispherers, G.W. or W.G. maker's mark, Conestoga Town (36La52), the State Museum of Pennsylvania, on exhibit. Hume (1969) believes the Wells foundry also of Aldbourne, was operating as early as 1694 and may have produced bells with a G.W. maker’s mark before the proprietorship of Richard Wells and sons (1755-1825). The R.W. engraving is a widely accepted diagnostic mark of the late 18th century Wells foundry, famous for producing sleigh bells in the largest array of sizes of any manufacturer in England. Sleigh bells with these marks have been found in archaeological contexts in Williamsburg, Virginia among other late 18th century colonial contexts. The petal bell is also the most common design for sleigh bells dating from the 18th and 19th centuries. The first American manufactured sleigh bells were produced in East Hampton, Connecticut by Captain William Barton and his descendants. Pictured below is an early example of a petal bell designed crotal most likely produced by a member of the Barton clan (circa 1740s-1845). American manufactured sleigh bell, 2 ¼” dia., 18th-19th century, Fort Hunter (36Da159), The State Museum of Pennsylvania. The bell was found behind the icehouse during 2013 PHMC excavations at Fort Hunter. Diagnostic characteristics include the petal engraved motif, the “B” marker’s mark present next to a single throat that terminates in circular ends, and the presence of two mold holes on either side of a cast u-shaped shank. This bell most likely belonged to the McAllister family who owned the property from the mid-1780s to the late 1800s. The presence of this American-made artifact among other household goods reinforces the political and economic transitions that occurred during and after the revolutionary war, as American craftsman began to fill the demand for fine-crafted goods formerly met by British import markets. Nineteenth-twentieth century sleigh bells, left-1 1/4" dia.,right-2" dia.,manufacture unknown, Westmoreland County, Robert Oshnock Collection, The State Museum of Pennsylvania. The sleigh bells from Westmoreland County pictured above also have a u-shaped shank like the bell found at Fort Hunter; however, the presence of four mold holes circling the shaft is likely evidence of post-1850 manufacturing techniques. There is a faint petal design and number “8” engraved on the larger crotal from the Milk site (36Wm540), indicating a 2” diameter size. The smaller bell, a general county find, displays a petal motif and also lacks a maker’s mark. The State Museum, Section of Archaeology wishes you a happy and healthy holiday season! 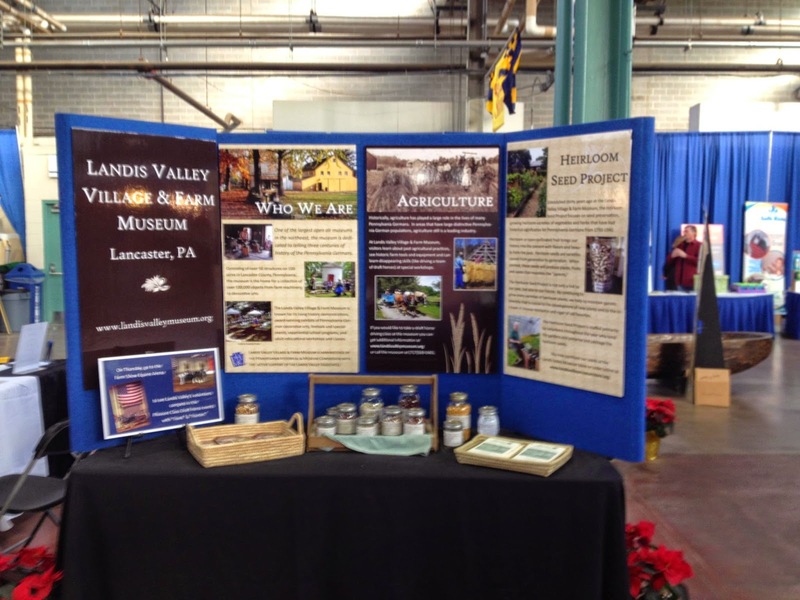 Please visit our exhibit booth at the Pennsylvania State Farm Show, January 10th-17th. The exhibit will feature artifacts and information focused around cultural change and adaptation to the environment since our earliest occupation in Pennsylvania about 16,000 years ago. Our booth is in the Main Hall in the Northeast section of the area, directly across from the Bureau for Historic Preservation and their Historic Markers scavenger hunt. 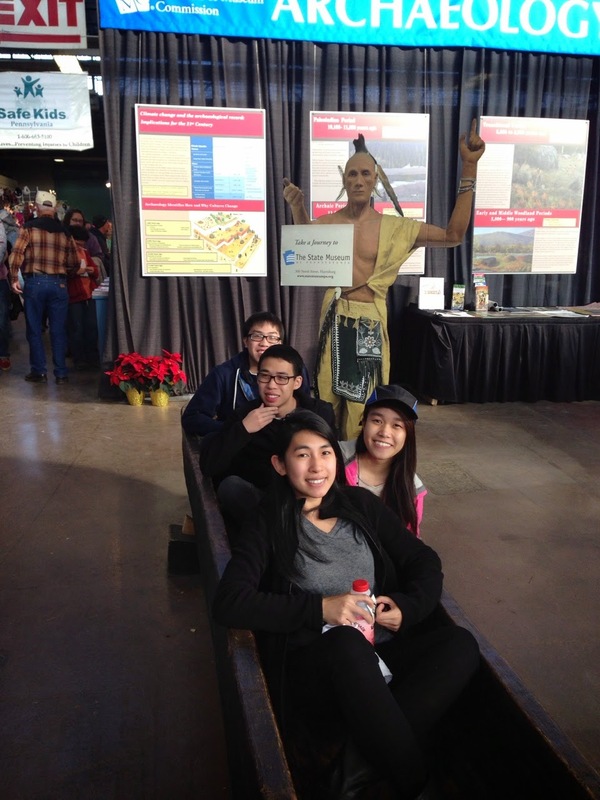 You can’t miss us, just look for the only 20 foot long replica of a Native American dugout canoe! 2014 The British Museum. 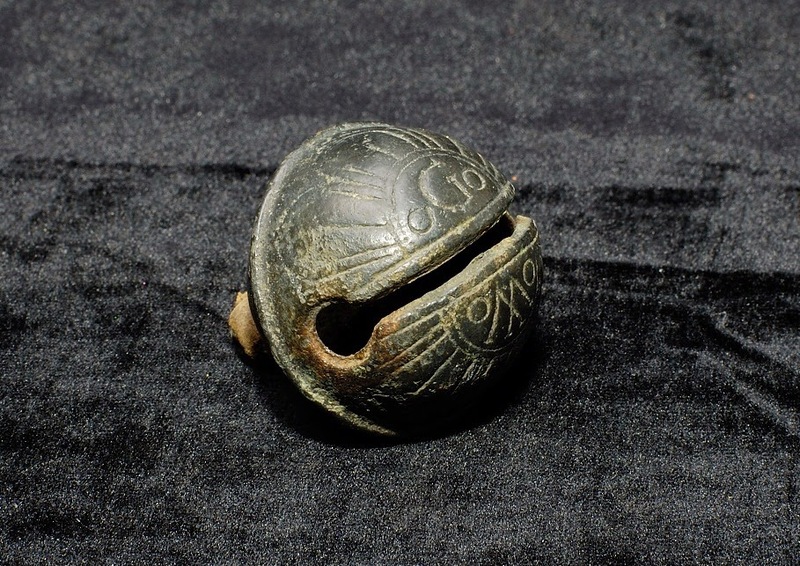 A History of the World: Crotal Bells. Electronic document. 2005 UK Detector Finds Database: Crotal Bells. Electronic document. 1957 New Discoveries at Jamestown. National Park Service. 1969 A Guide to Artifacts of Colonial America. University of Pennsylvania Press. 2001 Susquehanna’s Indians. Pennsylvania Historical and Museum Commission. 1988 A Guide to Excavated Colonial and Revolutionaly War Artifacts. Heritage Trails.